The previous theme was supposed to be there for a few months but it ended up being there for years. In this new theme I got rid of all the junk that had ended up in the sidebars. There are no advertisements as those were just distractions and since its a personal blog there was no real need to put them in. 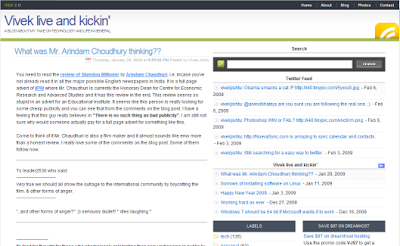 Also removed the twitter, soup and the other blog feeds. They were adding too much distractions to the content. Have got rid of search, rss feeds and a dozen other distractions that were coming in the way of the main content. This new theme is supposed to be a little better as it puts focus on the content. And hopefully with twitter going towards the dark side I just might end up blogging again. There are so many topics that are in the drafts mode. Whenever I get sometime to polish them a little I will do that. Overtime this blog has turned from being about technology to being about me. All the unpublished posts are about technology so lets see when they finally go public. Had planned to work a bit this weekend and so far with a new theme last night I think am still on track. Still there are elements on this blog that can be removed or edited but for now it seems fine. Hopefully this weekend will be a little more fruitful than the last few weekends and months. This is how the blog looked earlier. Not sure if anyone still reads the blog. But if you do, don't forget to leave a comment about the new theme.